Easily reached from Paris, Bordeaux and cities in the Loire Valley, Poitiers is rich in history, architecture and culture. 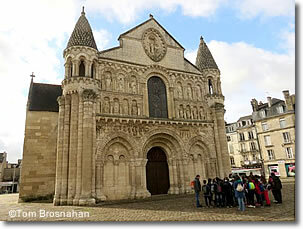 Historic Poitiers, 350 km (217 miles) southwest of Paris and 257 km (160 miles) northeast of Bordeaux (map), is known for its deep and eventful history, its well-preserved Romanesque and medieval architecture, and its university. Formerly chief city of the région of Poitou-Charentes, Poitiers lost that distinction in the 2016 reorganization of France's régions. Sitting atop a high promontory above the bordering Boivre and Clain rivers, Poitiers has always been an important natural military stronghold, which accounts in part for its significant—and often violent—history. Today visitors come to Poitiers to wander its narrow medieval streets, to sit and sip at cafés and restaurants in its picturesque squares and places, to see its many ancient churches, and perhaps to visit the Futuroscope theme park in Chasseneuil-du-Poitou 11 km (7 miles) to the north. existing Christian building in France. 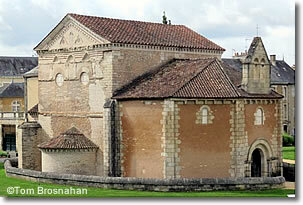 Église Notre-Dame-la-Grande (1086) is among the finest Romanesque buildings in France.